The Verdict: The Wells Fargo Cash Wise Visa® Card is both the best card that Wells Fargo (a WalletHub partner) has to offer and one of the best cash back credit cards from any issuer. But a limited-time offer has a lot to do with that. New applicants can now earn a $200 cash bonus for spending just $1,000 within three months of account opening. That’s tied for the second-biggest cash bonus among consumer credit cards, according to WalletHub’s database of 1,000+ offers. Without its initial bonus, the Cash Wise Card is still very good, just not elite. It doesn’t charge an annual fee, which makes it $17.35 per year cheaper than the average credit card offer. It gives you at least 1.5% cash back on all purchases, which is roughly 50% higher than the average cash rewards card’s base earning rate. And you even get a bit more (1.8% back) on mobile-wallet purchases for the first 12 months. Although the Wells Fargo Cash Wise Credit Card offers 0% introductory interest rates on purchases and qualifying balance transfers, it’s far less competitive for financing than it is for rewards. The length of its 0% intro term is slightly above average. There’s a balance transfer fee to take into account. And depending on your creditworthiness, the regular APR could be quite high. So it’s fair to say the Wells Fargo Cash Wise Visa Card is best for people who pay their bills in full every month and want simple, attractive everyday rewards. If you fit that description, make sure to check your latest credit score before you apply, too. You need at least good credit to qualify. To learn more about the Wells Fargo Cash Wise Visa, check out WalletHub’s complete breakdown below. $200 Initial Bonus: Far more valuable initial bonuses are available right now, but not in cash. Most of the best credit card deals, which offer $400+, require you to redeem earnings for travel. That’s fine for people who travel a lot, but not everyone does. If you want the flexibility of cash, only four cards offer bonuses of at least $200. 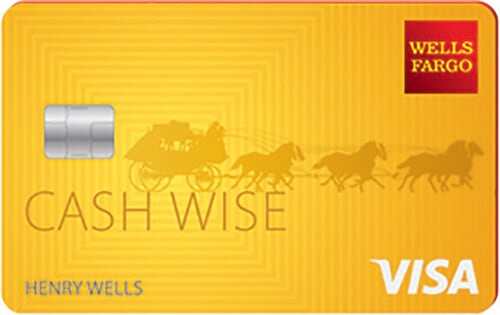 Not only is the Wells Fargo Cash Wise Card only one of them, but it’s also the most efficient. Cash Wise requires you to spend just $1,000 over three months to earn $200. That equals up to 20% cash back. 1.5%+ Cash Back on Purchases: The average cash rewards credit card currently offers just 1.06% back. So Cash Wise is clearly leaps and bounds better, considering that you’ll earn 47% to 75% more on every purchase you make. Most purchases will yield 1.5% cash back, and you’ll get 1.8% back when you pay with a mobile wallet. No Annual Fee: Most everyday cash back credit cards don’t charge annual fees. So the Cash Wise Visa’s lack of one probably won’t do much to differentiate it from the competition. But it will save you $17.35 per year compared to the average credit card offer. And all else being equal, not having to pay is always preferable. 3% Foreign Transaction Fee: It would not be wise to use the Wells Fargo Cash Wise Visa Card for purchases that will be processed outside the U.S. That means any purchase made while traveling abroad as well as purchases made from internationally based merchants. And that’s because the Cash Wise Card tacks a 3% surcharge onto foreign transactions. The average credit card charges just 1.50%, and there are dozens of no foreign transaction fee credit cards to choose from. 3%+ Balance Transfer Fee: The average household owes more than $8,000 to creditors. So they’d have to pay a fee of about $240 if they were to transfer that balance to the Wells Fargo Cash Wise Card. And that’s only if they make the transfer within 120 days of account opening. Otherwise, the card’s 3% intro transfer fee rises to 5%, bringing the average household’s expected fee to $400. There are much cheaper options offering 0% intro APRs for far longer. So there’s really no reason to opt for the Cash Wise Visa if you’re looking to reduce the cost of existing debt. $20+ Redemption Minimum: Wells Fargo Cash Wise cardholders cannot redeem their cash back earnings whenever they want. Rather, you can only redeem in increments of $25 (online and by phone) or $20 (with a Wells Fargo debit card at a Wells Fargo ATM). That could be a thorn in your side, for sure. But it shouldn’t be too big of an issue in the long run. Potential for a Very High Regular APR: The Wells Fargo Cash Wise Visa’s variable APR currently ranges from 16.24% - 28.24% Variable. That’s problematic for a couple of reasons. For starters, it’s not very transparent. Applicants have no idea which end of this very wide range they’ll get matched up with. And that uncertainty warrants concern, considering that the high end of that range is well above the averages for secured cards (18.81%) and credit cards for people with fair credit (22.57%), according to WalletHub research. Nevertheless, the decision here should be pretty clear. Even the low end of the Cash Wise Visa’s APR range is above the average among credit cards for excellent credit. So this is not the card for carrying a balance from month to month, particularly when regular rates are in effect. 0% Intro APRs: The average credit card offering 0% purchases gives you that intro rate for roughly the first 10.6 months your account is open, according to WalletHub research. And the average 0% balance transfer credit card delays regular rates by about 12 months. So the Wells Fargo Cash Wise Visa certainly isn’t bad as far as financing is concerned. But it’s nothing special, either. In short, the good or excellent credit needed to qualify for Cash Wise could buy you hundreds more in savings. You can use WalletHub’s balance transfer calculator to find the best offer for your needs. Cell Phone Insurance: If your cell phone is damaged or stolen, Wells Fargo will cover the cost of a replacement, up to $600 per claim and $1,200 per year. You just have to pay a $25 deductible. You’re limited to two claims every 12 months. And coverage doesn’t apply if you pay your cell phone bill with a Wells Fargo debit card or a Wells Fargo business credit card. Good Credit Required: This is important to reiterate because two-thirds of consumers don’t have the good or excellent credit needed to qualify. And you applying for a credit card you have no chance of getting will only hurt your credit standing. Fortunately, you can check your latest credit score for free on WalletHub. If you discover that you don’t have at least good credit, you’ll still have options. There are usually a few cash back credit cards for people with fair credit. And there’s even an option or two for people with bad credit from time to time. There’s a lot of competition among cash back credit cards for people with good or excellent credit. After all, people who seek out such cards tend to use their cards everyday and pay their bills on time every month. And competition among credit card companies leads to great terms for consumers. So make sure to consider all of your options before submitting an application. Transfer Fee: Either $5 or 3% of the amount of each transfer, whichever is greater. How do these compare to Ally Bank Credit Card? The Ally CashBack credit card and Wells Fargo Cash Wise Visa are pretty similar. The main differences are in their rewards. The Ally Bank credit card offers 2% cash back at gas stations and grocery stores, and 1% cash back on all other purchases. If you spend $500 during the first 3 months, you receive $100. There’s also a 12-month 0% APR promotion on balance transfers. The Wells Fargo credit card gives you 1.5% cash rewards on purchases. And during your first 12 months, you get 1.8% cash rewards on mobile wallet purchases (like Apple Pay or Android Pay). You need to spend $1,000 within the first 3 months to receive a bonus of $200. There’s also a 12-month 0% APR promotion that applies to both balance transfers and purchases. Now for the similarities. Both have no annual fee, but have a balance transfer fee of 3%, a cash advance fee of $10 or 5% of each advance (whichever is greater), and a foreign transaction fee of 3% of each transaction.